The tropical climate of Florida isn’t just a dream destination for many people seeking paradise. Our warm and inviting surroundings also make Florida a welcoming environment for a number of pests that can potentially wreak havoc on your lawn and home. Our expert team at Natural Green has researched and developed natural and organic pest control solutions that effectively treat and guard your lawn against the threat of pests. The reason that we prefer using natural and organic pest control is because we care about the health of our planet and our customers. With Natural Green, you don’t have to wonder if Hazmat gear is required before stepping onto your lawn. We also know the negative effect that many chemical pesticides have on both domestic animals in wildlife. For example, an article published on Smithsonian.com links the spraying of harmful pesticides to the drop in the bird and bee population in certain areas. We at Natural Green love all of the elements of our beautiful surroundings. Our goal is to work with clients who wish to maintain a pristine and environmentally friendly landscape. The idea behind our pest control methods is to treat your lawn with natural products that make your lawn a safe and welcoming haven for you, while creating an environment that deters pests. With our monthly treatment program, you can be sure to enjoy your lawn without worrying about the threat of pesky pests. Environmentally conscientious gardeners and farmers have been using natural and organic pest control methods for years. 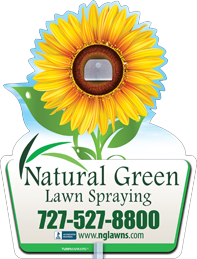 At Natural Green, we have taken those methods and combined them with modern research to create natural pest control products that effectively strengthen and protect your lawn. If you’ve ever seen a beautiful green lawn ruined by areas of brown patches, you’ve more than likely seen the negative effects of pests. These brown and balding areas in the lawn can becaused by chinch bugs that are very common in the state of Florida. If not treated, these bugs can quickly transform your dream landscape into a disaster zone. By regularly treating lawns with our natural and organic products, we have watched lawns regain their natural strength and beauty. Like the lawn, shrubs and palms have a number of pests that like to feed on their foliage. Our natural and organic pesticides can be compared to dressing a salad with one of your least favorite salad dressings. Once the shrubs and palms have been treated with our pesticides, pests will detect the organic ingredients and basically turn their noses up at the very thought of making a meal out of your landscape. Nobody likes the stinging sensation associated with the bite of a fire ant. Though ants are not a big threat to the plants found in your yard, they can pose as a threat to individuals with severe allergies to insect bites. 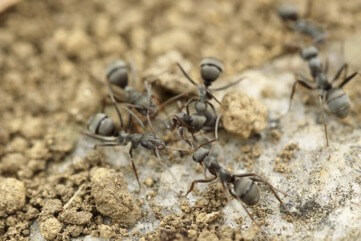 In addition to fire ants, other common ants like carpenter or sugar ants have the ability to tunnel their way right into homes and other structures. Our monthly maintenance program allows a Natural Green technician to thoroughly inspect your lawn to prevent possible ant infestations. Ticks are rather common in Florida. In addition to being a pest to both animals and humans, ticks spread harmful diseases that can be troublesome and debilitating. Our products serve as a deterrent to ticks and prevent them from overtaking your lawn. Though they are small in size, fleas can quickly turn your yard and home into an unpleasant space. If not properly monitored and cared for, fleas can quickly multiply and result in an infestation. Our products are made from natural ingredients that have proven to be extremely effective in abating and eradicating the threat of fleas. Nothing ruins an outdoor experience like a swarm of aggressive mosquitos. Because of Florida’s tropical climate, mosquitos pretty much have a year-round presence. In addition to causing an itchy welt after they attack, the buzzing carnivores are also known for spreading deadly diseases like West Nile and encephalitis. By combining our natural products with knowledgeable and routine prevention methods, Natural Green helps to keep your outdoor space a sanctuary that can be enjoyed throughout the entire year. For a free analysis and more information about our natural outdoor pest control service, click on the link below to schedule an appointment with one of our knowledgeable and friendly technicians. Or you can view more information about our monthly plans.